As the second-driest state in the Union, water management is critically important in Utah. But what does “water management” really mean? This month, we’ll take a look at what water management is in the Central Utah Water Conservancy District, and the resources we use. Our mission is to responsibly develop, conserve and deliver water. Part of this mission is to ensure that there are adequate water resources to meet the needs of residents, households, industries and agriculture in the Central Utah district. And that requires careful management, and occasional trade-offs. We use water for many different things: domestically for drinking, washing and cooking; in industry for a range of purposes; in farms and ranches; and we use water for recreation, as well. In addition, the natural environment requires a reliable supply of water for survival. As of last year, Utah’s total population was just over 3 million. The total public supply of fresh water averages 621.99 million gallons of water every day. That comes to a total of 402,512 acre-feet of fresh water over the span of a year. The latest available statistics show that daily domestic use of water is about 506 million gallons. On average, people of Utah consume 213 gallons of water each day for drinking, washing, cooking and other household use. Most of the water for domestic use, about 85 percent, is from the public water supply, with the remainder being self-supplied, for instance from wells. The total domestic consumption accounts for 80 percent of the water from the public supply. Commercial use is defined as hotels, restaurants, office buildings and institutions. The commercial sector in Utah gets most of its water from its own supply, such as wells. The industrial sector includes manufacturers, petroleum refining and agriculture, which gets 80 percent of its water from its own wells or surface water supplies. That’s the picture as of 2015, but Utah is growing. Some estimates say Utah’s population is the second-fastest growing in the United States. 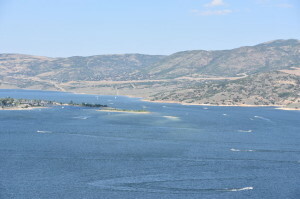 An audit of Utah’s water needs, delivered to the State Legislature in 2015, predicted that the statewide demand for water will exceed the currently developed supply by 2040. That’s why we’ve launched a number of initiatives for a variety of reasons: to develop the supply of water, increase the efficiency and reduce water losses, and promote conservation and responsible use of water resources. The Central Utah Water Conservancy District’s free Water Festival teaches water conservation and water safety tips for all ages. That’s a high-level view of the demand for fresh water in our state. Let’s take a look at the sources from which we can derive water to meet our state’s demands. The Central Utah Water Conservancy district water management includes five streams and 11 reservoirs. To get water from reservoirs and streams, our water management system includes a number of canals, dams, aqueducts, and pipelines that divert water from where it is to where it’s needed. In addition, there are many privately-held groundwater and surface water resources. According to federal statistics, the commercial and industrial sectors are almost completely self-supplied in Utah. Another important source of water for commercial and industrial use, particularly in power generation, is reclaimed wastewater. This is effluent, or outflow, from wastewater treatment plans that is cleaned, and then used for irrigation or thermoelectric cooling, instead of being released into a natural waterway or aquifer. Did you know that you can see real-time statistics on the supply and outflow of water from all the streams and reservoirs in the district? Water management in Orem Utah can be fascinating. It’s important for all of us in this beautiful (but dry!) state to understand the demand for water, the supply and how we can all play a part in its responsible use.